Love comes in many forms, and even romantic love is not limited to sexual partnership. The bond between gay men and their female friends, though sometimes complicated by mismatched desire, can be as profound as a marriage. Artist and author Tom Taylor a/k/a The Poet Spiel explores this truth in a bittersweet narrative poem about the only woman he loved. 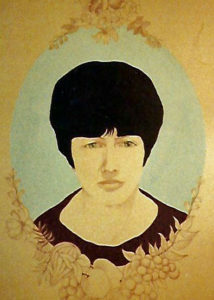 Below is his portrait of Phyllis. He tells me she died in a plane crash in 1972 with her husband, leaving behind their two children. May their memory be a blessing. The Young Master and I have been bonding over our love of comics and graphic novels since I returned from Flame Con with Warrior Cats manga and Lumberjanes. I read them aloud to him, and he re-reads them for the pictures and action, sounding out the simple words he knows. Every day for weeks after we finished Graystripe’s Adventure, he asked me to make-believe we were Graystripe and Firestar, feline best friends who lead a noble clan of feral cats in the forest. This full-color manga has a positive environmentalist message, as the cats’ home has been destroyed by human development. We also enjoyed the manga trilogy collected in Ravenpaw’s Path, where Graystripe’s friend Ravenpaw turns away from his warrior heritage to live in a barn with his male friend Barley. I appreciated the covert queer rep (though nothing romantic is shown on-page, Barley is essentially his life partner) and the storyline about the limits of loyalty to toxic family members. Although Graystripe is too tough to consider this a compliment, the cats as drawn by James L. Barry are awfully cute and have realistic body language–they’re genuine cats, not Disney plushies. Since the Young Master is a fan of the movie “Coco”, and I bawl sappy tears every time we read the picture book version, I guessed correctly that we’d like Raina Telgemeier’s Ghosts, a kid-friendly but serious graphic novel about a Mexican-American family whose younger daughter has cystic fibrosis. In the days leading up to Día de los Muertos, the sick girl and her older sister cope with impending mortality through encounters with friendly spirits. Folks, I broke down crying on the last two pages and could hardly read them aloud. But they were happy tears. Have your tissues ready. Shane loved this one too. At his request, we borrowed Claudia and Mean Janine, a book in Telgemeier’s “Baby-Sitters Club” series, though tween girl friendship drama did not hold his interest. I think the issue is genre, not gender; he shows a strong preference for non-human protagonists and fantasy settings. Unlike Claudia’s Type-A parents, I will never police his choices as “not great literature”. His latest make-believe scenarios come from Dragons Beware!, the second volume in the Chronicles of Claudette, by Jorge Aguirre and Rafael Rosado. (I hope the library has the first book, now!) Claudette is a fearless, flame-haired, tomboyish child in a medieval French village. With the help of her kid brother Gaston, who’d rather be a pastry chef than a fighter, and their friend Marie, a nobleman’s daughter who believes all problems can be solved by diplomacy and good hair, Claudette challenges mythical beasts and defeats an evil wizard. Her father is also a formidable warrior and blacksmith, despite being legless in a wheelchair. Limited dialogue and action-packed panels make this book a great read-aloud for the first-grade set. Mild spoilers ahead. The books braid the real-world story of Doug, a photographer and failed performance artist obsessed with his lost love Sarah, with the nightmare visions of his alter ego, Johnny 23, a low-level functionary in a breeding factory where woman-like creatures produce monstrous eggs. The features of his grotesque dream world make no sense in the first volume, but gradually reveal parallels to the themes around which Doug’s mind circles endlessly: the death of his depressed father, the work of avant-garde artists that Doug and Sarah imitate in a shallow way, and Sarah’s ritualized guilt and masochism. Why is Doug’s alter ego an invalid with a bandaged head, in a landscape of insanity? Did Sarah succumb to her abusive ex-boyfriend or self-harm? We are led to expect a dramatic resolution to their story, a big reveal worthy of the post-apocalyptic menace of its fantasy double. The ending of both narratives is banal and anticlimactic, which at first left me feeling cheated, till I realized this was the book’s brilliant objective all along. The real tragedy of Doug’s life is that there is no tragedy; like his father before him, he falls victim to a self-aggrandizing narrative that the reader is at first seduced into accepting, too. Do the peculiar features of his nightmare world have any symbolic meaning, in the end, or is the message that “there’s no there there,” no substance behind the Burroughs-style cut-up performance poetry that Doug thinks is so profound? Sarah starts out as whatever the Goth equivalent of a Manic Pixie Dream Girl is, but she outgrows it and he doesn’t. To the extent that there’s any logic to his fantasy of angry lizard-headed factory managers and egg-laying girls, I interpret it as Doug’s horror of adulthood. It’s the world of the suburban heterosexual salaryman, the Willy Loman figure that his dad became. The monster that looms invisibly over this world is the mother archetype. The real female body, representing the cycle of birth and death, ruins his idealized image of his lover and the Tintin-like eternal adolescence that he desires with her. Doug’s mother is never seen on-page, though she supposedly lives in the same house where Doug convalesces and Dad mopes in the basement with a photo of his old girlfriend. Johnny 23 brings 1960s romance comics to the breeder girls, the same comics that real-life Sarah loved and Doug disdained. The most grotesque moment, in a book that’s full of them, comes when Johnny’s favorite girl unveils her giant dripping ovipositor from beneath the blankets, begging him to catch the egg that he can’t bring himself to touch. The woman that Doug is married to, in the last book, doesn’t seem quite real: she is impossibly understanding of his Sarah obsession and occasional tumbles off the wagon of sobriety, and her helmet hairdo belongs to the previous generation. She is a sexless fantasy mother, Wendy to his Peter Pan. I wondered about the Asian flavor of the nightmare realm. His sometime guide is a sort of midget sumo wrestler, and the monstrous characters at the unhygienic outdoor market speak a language speech-bubbled in kanji (probably not real but I can’t tell). Was this a nod to the ethnocentrism of the original Tintin comics? A clue comes in the final pages of Sugar Skull, when Johnny 23 encounters a Buddhist-looking shrine just before his aimless journey starts all over again. I think Doug is trapped on the wheel of samsara. The extreme manifestations of bodily excess in his dream world (culverts pouring blood, maggots with human faces, the fetus in the breeder girl’s dropped egg) are analogous to Siddhartha’s encounters with aging, sickness, and death (the Four Sights), but he has not yet taken the opportunity to seek an end to anyone’s suffering, not even his own. Perhaps the spirit of Inky the Cat will lead him out of the Hungry Ghost realm eventually? We can only hope.